One Venkatarama lyer questioned Ramana, in Skandasramam days, whether combining activities and Self-attention is possible. Q: Whichever way one turns, one finds that the mind has to be subdued. We are told it has to be controlled. Can this really be done when on the one hand the mind is an entity not easily grasped and on the other one continues to have worldly worries? it has been so from the moment of creation and will continue likewise till pralaya (destruction). He will then resolve to learn to bathe in it, as it is. its grip. So too here." Paul Brunton has also plied Sri Ramana with questions on this point. Q: How is it possible to become selfless while leading a life of worldly activities? A: "There is no conflict between work and wisdom." Q: Do you mean to say that one can continue all old activities, in oneâ€™s profession for instance, and at the same time get enlightenment? meditation. The current generated by association with the energy source in the heart would be the continuous substratum with its overflowing peace and joy. done when all straying ceases, when the mind is merged in its source firmly, without a break, who can describe the joy of such a life? true home as surely as the restless rain drops rejoin their source, the wean, or the birds return to earth from which they have risen and for a while in the sky. intellectually first, then do not stop with that. Practise it. All people cannot be expected to do the same kind of action. Each one acts according to his temperament and past lives. interlocked. Meditation on forms is according to oneâ€™s own mind. You say you are the body in wakeful state; not the body in sleep. Q: Is it better to pray or not to pray when you do not understand the meaning of the chants? A: If you compare and try to decide between praying and not praying, the one who prays is nobler than the one who cannot pray. One who regularly prays at least has the decency to accept the presence of a superior intelligence, guiding, protecting, helping and serving all beings. When such an individual prays, his mindâ€™s attention is, at least for the time being, lifted in devotion to that mysterious, unknown, but ever-benevolent Supreme. In order to maintain the mind in that uplifted mood, chants, hymns, maṅtra and rhythms and special sanctified areas like temples or churches can all be great help. The next best thing is to understand the meaning of what we are chanting. 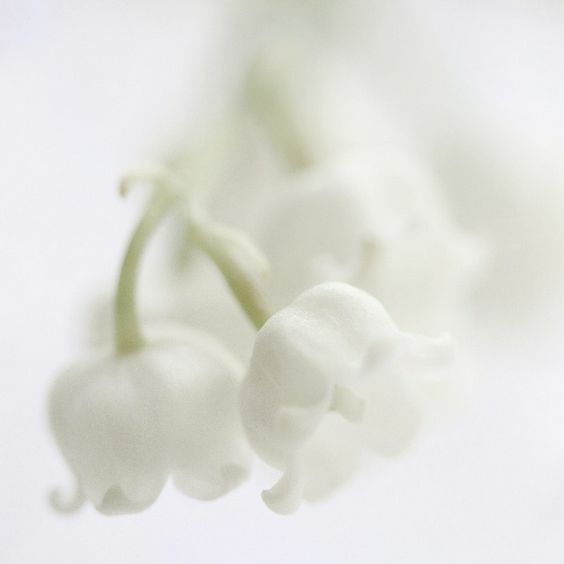 In itself the meaning has nothing to add to the seekersâ€™ spiritual stature because there are many erudite scholars who can understand the meaning of a chant, but they have no devotion to lift their minds toward it. Even if you do not know the meaning, chanting is useful. A mother lovingly hugs the child, prattling and humming, and the child, who can understand nothing of words, becomes consoled and falls asleep. Practice chanting for six months; bring it within your own personal experience and you will know the truth of it. A looter merely repeated the word â€œRam, Ramâ€� and reached the status of Valmiki; and a little innocent child, Dhruva, repeating the maṅtra â€œOm Namo Bhagavate Vāsudevāya,â€� attained enlightenment. It is not the meaning of the words that is important. They are a crutch for the mind to turn in the direction of the Self. In ardent faith, with true and deep devotion, and with the mind not running into sense objects, if we can turn our attention for a few moments a day to call out to Him, it will be the most effective prayer. The child may be in any part of the house; it need not know where the mother is, but the moment the child cries, â€œMa, Ma,â€� the mother appears and gathers the child to her bosom. In this book, two visionaries: Swami Chinmayananda and Swami Tejomayananda address many questions that can arise in the minds of spiritual students. Their answers are thought provoking and immensely inspiring. Q : How is the ego to be destroyed? SRI RAMANA MAHARSHI: Hold the ego first and then ask how it is to be destroyed. Who asks this question? It is the ego. Can the ego ever agree to kill itself? This question is a sure way to cherish the ego and not to kill it. If you seek the ego you will find it does not exist. That is the way to destroy it. Q: Why is the concept of God necessary in spiritual life? A: It is not necessary as long as one is willing to logically and truthfully investigate the body, mind and intellect and the perceiver, feeler, thinker in relation to the objects, emotions, and thoughts. Such an enquiry will lead to the Subject in us, and we will be forced to accept that something other than matter is expressing itself through matter. This spiritual essence is indicated by the word God. Dr. T. N. Krishnaswamy gives an account of his experiences as the `official photographer' of the Ashram. As confirmed by Sri Bhagavan, the Divine assumes a visible, physical form out of Grace to give solace and guidance to devotees. The importance of Sri Bhagavan's pictures is therefore obvious. OWING TO MY busy life in Madras I could usually spend only a day or a part of a day at Tiruvannamalai when I went there. I always took my camera with me and I used to spend the whole time with the Maharshi and take as many photos of him as I could. I was afraid he would get annoyed at my persistence, but he never did. I have photographed him walking, sitting, eating, wiping his feet. I have caught him smiling and laughing, speaking and silent, and also in samadhi. Once he was going up the Hill when it started to rain and he was offered a home-made palm-leaf umbrella and I snapped him using it. I took another picture of him using an ordinary umbrella and smiling broadly as he did so. Sometimes I used to wonder if it was not ridiculous of me to pay so much attention to photography when his teaching was that "I am not the body". Was I not chasing the shadow and even trying to perpetuate it? At the time I paid very little attention to his teaching. I was attracted only by the beauty and grace of his person. It gave me immense pleasure to take pictures of him. He was more important than, his teaching. Later, when he was no longer bodily with us, I turned to his teaching; and then I found that the Grace of his Presence had prepared me for it. I had been attracted to him as a child is to its mother, without knowing why I had derived sustenance from him as a child does from its mother. I was glad afterwards that I had enjoyed his presence when he was bodily with us. The following little incident shows how he himself approved of people worshipping the physical form assumed by the Divine. One day I was walking on Arunachala with the Maharshi when he picked up one small stone from the path and held it out to me saying, "Someone has written from abroad asking for a stone from the holiest part of the Hill. He does not know that the whole Hill is sacred. It is Siva himself. Just as we identify ourselves with a body, so Siva has chosen to identify with the Hill. Arunachala is pure Awareness in the form of a Hill. It is out of compassion to those who seek him that he has chosen to reveal himself in the form of a Hill visible to the eye. The seeker will obtain guidance and solace by staying near this Hill." Thayumanavar or Tayumanavar, Tamil: தாயுமானவர் (1705â€“1742), pronounced Thāyum-ānavar, is one of the spiritual giants and a Tamil philosopher from Tamil Nadu, India. Thayumanavar articulated the Saiva Siddhanta philosophy. He wrote several Tamil hymns of which 1454 are available. His first three songs were sung 250 years ago at the Congress of Religions in Trichinopoly. His poems follow his own mystical experience, but they also outline the philosophy of South Indian Hinduism, and the Tirumandiram by Saint Tirumular in its highest form, one that is at once devotional and nondual, one that sees God as both immanent and transcendent. On another occasion, when I asked Bhagavan to select some reading material for me, he gave me a short-list of six books: Kaivalya Navanitam, Ribhu Gita, Ashtavakra Gita, Ellam Ondre, Swarupa Saram and Yoga Vasishtam. He laid particular stress on Ellam Ondre, telling me, "If you want moksha write, read and practise the instructions in Ellam Ondre." The above is not quite correct.His songs clearly bring out the advaita vedantin in him although he harmonised it with yoga.Thayumanavar was truly a Sage without any boundaries.Below is one of the songs that clearly brings this out. Let us in meekness worship. Thayumanavar's songs are truly a rare Treasure for all aspirants. (Selected portion of a devoteeâ€™s reminiscences. Tato yuddhaparishraantam samare chintayaa sthitam. a fresh battle was lost deep in contemplation. destroying all enemies and bring you victory and never ending supreme bliss. and is the destroyer of sin, anxiety, anguish and is the bestower of longevity. universe by whose efflugence all else brighten. He indeed represent the totality of all celestial beings. energizes the inhabitants of all the worlds and the race of Devas and Asuras. Eshhah brahmaa cha vishhnushcha shivah skandah prajaapati. He is Brahma, Vishnu, Shiva, Skanda, Prajapati. He is also Mahendra, kubera, kala, yama, soma and varuna. Pitaro vasavah saadhyaa hyashvinau maruto manuh. is the maker of all the six seasons. Aadityah savitaa suuryah khagah puushhaa gabhastimaan. the golden hued brilliance and is the maker of the day. He is the Omnipresent One who pervades all with countless rays. misfortunes and is the infuser of life. the son of Aditi, and has a vast and supreme felicity. He is the remover of intellectual dull-headedness. Vyomanaatha stamobhedii rig yajuh saama paaragah. crossed the vindya range and sports in the Brahma Nadi. Aatapii mandalii mrityuh pingalah sarvataapanah. one being exceedingly energetic sustains the universe and all action. Nakshatra grahataaraanaam adhipo vishva bhaavanah. in the twelve forms of the Sun. Namah puurvaaya giraye pashchimaayaadraye namah. Lord of the stellar bodies and the Lord of the Day. Jayaaya jayabhadraaya haryashvaaya namo namah. Salutations to the One who ordains victory and the prosperity that follows. the thousand rayed Lord, and to Aditya. Namah ugraaya viiraaya saarangaaya namo namah. Salutations to the Terrible one, the hero, the one that travels fast. and to the fierce and omnipotent one. illuminator and devourer of all and is of a form that is fierce like Rudra. of the ungrateful and to the Lord of all the stellar bodies. Tapta chaamiika raabhaaya haraye vishvakarmane. Namastamo. of darkness and salutations again to the effulgence that is the Cosmic witness. Naashayatyeshha vai bhuutam tadeva srijati prabhuuH. Salutations to the Lord who destroys everything and creates them again. up and sends them down as rain. Eshha supteshhu jaagarti bhuuteshhu parinishhthitah. Vedaashcha kratavashchaiva kratuunaam phalameva cha. lose heart (and become brave). devotion. Recite this hymn thrice and you will win this battle. Asminkshane mahaabaaho raavanam tvam vadhishhyasi. O mighty armed one, you shall truimph over Ravana this very moment. became free from worry after hearing this. He was greatly pleased and became brave and energetic. forth all his effort with a determination to destroy Ravana. Atha ravi ravadanam nirikshyam raama Muditamanaah paramam prahrishhyamaanah. looked at Rama and exclaimed 'Hurry up' with great delight. 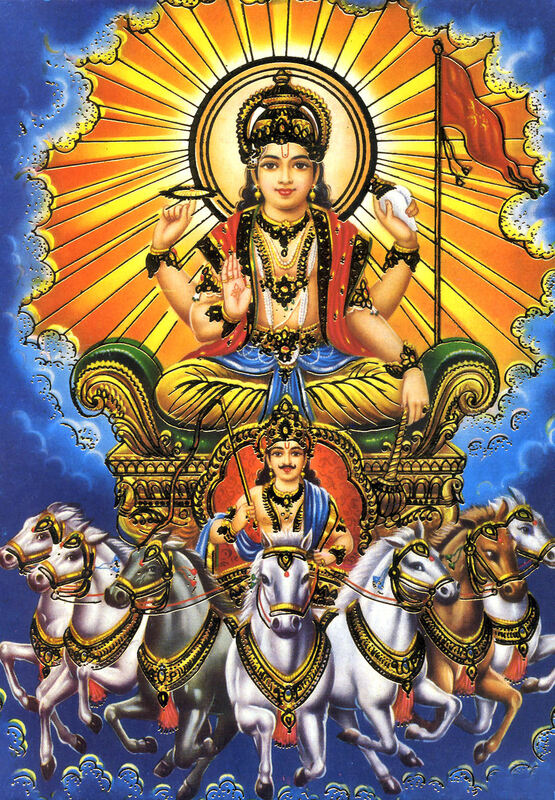 Today is ratha saptami;thanks for the post on Aditya Hrudayam. This festival is associated with 'Bhishma Pitamaha, the legendary king of Mahabharata whom Lord Krishna praised as the Lord of the lords. Bhishmashtami ie Bhishma Ashtami,is the festival which is celebrated on the twenty-third day of Magha (Jan-Feb) and eighth lunar day of the light half (waxing phase of the moon). Important part of this festival is the worship of the Pitris, the ancestors.It is the next day to Ratha Saptami.It is believed that Bhishma's soul departed on this day after the war of Kurukshetra came to an end. Bhishmashtami is dedicated to Bhishma, the son of Ganga, and great uncle of the Pandava and Kaurava.Bhishma died childless without any direct descendant. On this day devotees take bath early in the morning,perform the pooja and observe the fast from sunrise to sunset.Being the 'Pitamaha', all the devotees come together and make religious offerings of Ganga-water, to his spirit.Sesamum seeds and boiled rice is offered to him.These rituals compensate the sins of the whole year. This offering is given to the childless hero Bhishma of the race of Vyaghrapada. Then people pray saying, "May Bhishma, the son of Santanu, the speaker of truth and defeater of his passions, obtain by this water the oblations due by sons and grandsons." Thank You Very much Sir, for beautiful gesture,by opening the thread Poems. With,also,wonderful poem "If". Yes,that is a wonderful,wise poem by Rudyard Kipling.I heard Roger Whittaker sing that as a song and was drawn to it and found that it was composed by Kipling.Thanks very much.